Family holidays are fun once you arrive at your destination but sometimes the road trip to get there can be a bit of a nightmare, especially when travelling with children! Traveling with kids is all about being organised because keeping children busy in a confined space for any length of time is very difficult if one has not planned sufficiently. So, no matter how long your road trip to the Drakensberg is or where you are travelling from, we have some tips for you to keep the kids entertained along the way! Make a list of everything you and the children will need, this includes snacks or “padkos” and clothing, try get the children to pack their own things or to help you compile a list of what they will need. This will help make them feel part of the trip planning. It is important to make a time and stick to it so that you reach your chosen destination on time and preferably while it’s still light out. Depending on how your children sleep or how old they are, you might be able to get away with lifting them straight from their beds into the car (at some obscene hour in the morning) to get an early start on the road and allow them to kill some of the time by sleeping (don’t forget to pack breakfast to avoid stopping when they wake up). If your kids are a little older, try to get them to eat at home before you leave. – Make individual activity baskets and fill them with books, toys, magnetic puzzles, colouring books and playdough to keep their minds off the journey or the wait! – Invest in “lap trays” (those strange looking boards attached to a beanbag like cushions) so that the kids have a surface to play on. – Buy books on tape…this will provide plenty of entertainment without mum and dad having to say much at all! – Stretch exercise bands (often used for Pilates – can be bought at most sports stores) take up next to no space and provide the kids with some entertainment as well as allowing them to stretch without having to make a stop or get out the car! – It is key to keep some activities up your sleeve for later! Keep some items/toys in the boot or cubbyhole to rotate into the mix when it looks like the children are getting bored! – When all else fails, there is always a good old game of “eye spy” or good joke book to keep them occupied. Snacks not only add to the list above in terms of keeping the kids busy but snacks are also essential to avoid excessive stopping AND if planned correctly, will save you money too! Try to have a balance of healthy snacks that will fill their tummies as well as some fun treats to keep things interesting! Avoid too much sugar because they won’t be able to burn it off until they reach the wide open spaces in the Drakensberg! 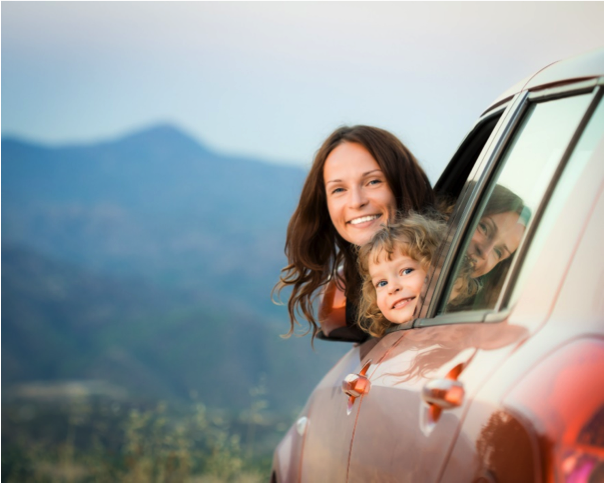 We hope these tips help you survive your next road trip with your kids and hope to see you soon! Find directions to the Drakensberg Mountain Retreat or contact us to make a booking for your family today!